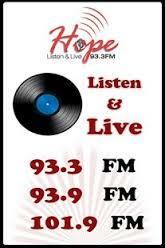 Hope FM 93.3 Kenya Live Streaming Online . Listen over 50 Kenya FM Radio Stations Live Online . Enjoy Live Stream of Kenya FM stations 24 by 7 online.Please wait for 30 seconds to listen this Station(Player loading may take 30 Seconds). Hope FM Live is a famous Christian radio station broadcasting from Nairobi.This is one of the most famous FM Radio Station in Kenya . Hope FM is a Radio Ministry of Christ is the Answer Ministries.The vision of Christ is the Answer Ministries is to impact Kenya and the rest of the world with the Gospel of Jesus Christ through the transforming power of the Holy Spirit. This Station programming ranges from a vast mix of praise and worship gospel music, both local and international,interactive discussions on biblical,inspirational talks, commentaries, current, social, real life issues and advertising services. They also offer the latest in news, sports and the happenings within the global church.